What is Yoga? The word 'yoga' means 'union' or 'merger' in Sanskrit, the language of ancient India, where it was originated thousands of years ago. It is practised by sages and common people to achieve good health, longevity, and rejuvenation and in the later stages of enlightenment - self realization. The ultimate aim of yoga philosophy is to strike a balance between mind, body and attain self-enlightenment. Samadhi Absorption -the ultimate state of self-realization). You can see some of the Yoga postures here. Benefits of Yoga are many. If Yoga is practised daily many diseases can be prevented and one can attain good health, and spiritual and intellectual growth. Many consider yoga for stress management. Yoga postures are called Asanas. 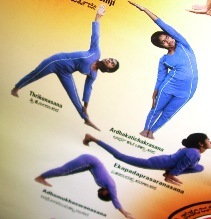 These asanas are done in different postures. Some are in standing position, some others in sitting position, and some in lying position. There are certain Prayers to be chanted for learning and practising Yoga. In India,Yoga is taught and practised in a very systematic way. Enjoying a Yoga Vacation in this historic land can really be a memorable one. There are several Yoga centers for yoga classes and famous Gurus for teaching yoga in South India. In Yoga, Surya Namaskara (Salutation to Sun) is very important.